Soak beans overnight in a lot of water. Drain and rinse beans, discarding the water. Place the beans in a Dutch oven or cast iron pot. Add water. Bring to a boil. In the meantime, cook the bacon in a large skillet until crisp. Drain the fat and reserve. 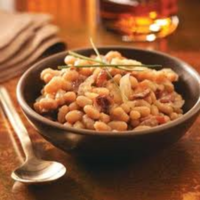 Place the onion in the middle of the beans, add the maple syrup, dry mustard, salt and pepper and bacon and bacon fat. Cover and bake in a 300 degrees F oven for 3 to 3 1/2 hours or until the beans are tender and reach the desired consistency. Stir the beans every 30 to 45 minutes. Maple syrup instead of brown sugar, great idea. This looks good to try.